The mobile food industry hasn’t necessarily been welcomed with open arms in many U.S. cities. Food truck operators in places like Washington, DC, and San Francisco are often fighting complicated regulations and zoning requirements that would limit the areas where they could legally operate. The SoCal Mobile Food Vendors Association wants to change that and is working city-by-city to help local food truck operators establish associations and work toward beneficial regulations in their area. “Just like any business—forget that it’s food trucks—every business wants a regulatory environment that’s going to allow them to succeed or fail on merits,” said Matt Geller, president of SoCalMFVA, who over the past couple of years has helped form food truck associations in Washington, DC; Baton Rouge, Louisiana; Denver; Philadelphia; New York; and New Orleans. Over the past three years the SoCal Mobile Food Vendors Association has assisted 11 other food truck associations form. We have provided guidance, bylaws and help with 501(c)(6) filings for non profit status. We do this because we believe that strong advocacy nationwide furthers our cause here in California and because we believe that everyone deserves a voice. We’re expanding our initiative to help fledgling food truck associations. If you need help creating or organizing a new food truck association, please email us and we’ll do our best to help out. The first step in getting an association together is getting the relevant parties (truck owners) into a room to discuss the issues. The first meeting should be used to identify the most important issues facing the industry in your area. Create a list in order of importance. Typically lists include: bans, time limit restrictions, street vending restrictions, private property bans, etc. Once the list is together a strategy can be developed to achieve your goals. Who: Meals on Wheels of Long Beach, a non-profit home delivered meal program for seniors, veterans and the disabled who may have difficulty shopping or cooking for themselves, and The Rock Club’s ‘Rock for Vets’, a non-profit Music Instructional Program located at the Long Beach VA Hospital. What: This will be a joint fundraiser and proceeds will help feed homebound Veterans in the Long Beach and Signal Hill area with daily meals from Meals on Wheels and provide funding for The Rock Club’s ‘Rock For Vets’ Veteran focused Music Instructional Program in Long Beach. Live musical performances by the ‘Rock For Vets’ Music Educational Band, Freddie Davis Jr. (performed with The Drifters, The Platters and Hank Ballard’s The Midnighters), Long Beach’s own Boxcar 7, The Windy Ridge Bluegrass Band, the Pin-up Doll Platoon, plus Sean ‘ELVIS’ Martin. Numerous raffle items, a silent auction and Gourmet Food Trucks with the Long Beach Derby Gals as hostesses (kicks off at 12pm). Variety Show tickets are only $25.00 per person and if you cannot attend, please send a Veteran in your place. To purchase tickets now or to donate for a Veteran, visit WWW.MOWLB.ORG find and click ‘Save the Date’ image on the right. Seating is open and limited. Tickets will be held at will call & confirmations sent via email. We realize that you have a choice of who you support throughout the year. Please join us in this great collaboration to make this event a huge success. Sponsorship opportunities are also available; please contact Frank McIlquham, Director of The Rock Club via email to frank@therockclub.net or Bill Cruikshank, Director of Meals on Wheels of Long Beach at bill.cruikshank@mowlb.org. Event Sponsors: St. Mary Medical Center, Fresh & Easy Markets, Home Instead Senior Care, Speedpro Imaging Long Beach, The Queen Mary, Delightful Crepe Café, Delius Restaurant, Long Beach Ballet, Long Beach Playhouse, California Repertory, Q Guitars, International City Theater, Long Beach Shakespeare Company, Antica Extra Virgin Olive Oil, BC Auctions, The Fit Stop, Long Beach Derby Gals, KMC Musicorp, Downtown Long Beach Business Association, Greg Campbell DDS Dentistry, CareMore, Signal Hill Tribune, Long Beach Post, Orange County Breeze, California Bowlers Association, Turner Chiropractic & Wellness Center, Orozco’s Automotive, Performance Plus Tire & Automotive, Scottish Rite Ernest Borgnine Theater, BC Auctions, Rock for Vets & Meals on Wheels of Long Beach. About The Rock Club “Rock for Vets” program: The “Rock for Vets” music instructional program founded in May of 2010 is a nonprofit 501(c)(3) organization located at the Long Beach VA Hospital. The program provides veterans an opportunity to learn to play a musical instrument or sing and become part of the band that is guided by former professionals from the music industry. The band practices twice a week and as they develop their skills, perform in public for a variety of organizations and fundraisers both at the VA Hospital and in the community. As one veteran stated, “This program gave me a reason to live. I no longer have thoughts of suicide”. For more information please visit WWW.THEROCKCLUB.NET . About Meals on Wheels of Long Beach: Meals on Wheels of Long Beach (MOWLB) was established on March 1, 1971 and is a non-profit, non-government funded, 501(c)(3) community service organization. The program operates with the assistance of over 300 dedicated volunteers, numerous donors and seven permanent staff. MOWLB provides a service of two home delivered nutritionally balanced meals w/ beverages each weekday for individuals who are unable to shop and cook for themselves and who may live alone. Our clients consist of seniors, veterans, the physically & mentally disabled and chronically ill adults in the Long Beach and Signal Hill communities. The meals are delivered by an army of “Friendly Visitor” volunteers who not only bring a meal but a visit and smile each day. For more information please visit WWW.MOWLB.ORG . 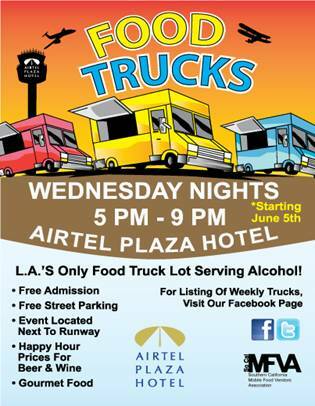 The Airtel Plaza Food Truck lot is BACK!!!! The best happy hour and the best trucks in the Valley every Wednesday night starting June 5th! 7277 Valjean Ave., Van Nuys, Los Angeles, CA 91406. Check Lawndale off as another city that has abandoned an antiquated ordinance restricting food trucks. The city joins Torrance and El Segundo among the South Bay cities that have drafted new food truck ordinances to adapt to the gourmet trucks so popular with foodies these days. In all three cases, the changes have been due to pressure applied by the Socal Mobile Food Vendors Association, an advocacy group for food truck owners. In Lawndale’s case, the association filed a lawsuit against the city demanding changes to its food truck ordinance. The City Council responded in early March with a new ordinance giving all food trucks greater latitude. Now food trucks can operate any day of the week and don’t have to relocate every 10 minutes as required under the old ordinance, a Lawndale city official said Tuesday. The lawsuit did not seek monetary damages, according to court documents. Lawndale didn’t have a food truck problem, according to Deborah Holland, Lawndale’s municipal services manager. City officials estimate only about three of the mobile eateries hold permits to sell chow in Lawndale city limits. What Lawndale had was an ordinance problem. “We just wanted to be consistent with state laws,” Holland said. To read the rest of the article go to The Daily Breeze. We have added a classifieds section to our site. We thought it would be nice if trucks and people servicing trucks had a place to post their jobs, goods and services. The Association does not endorse any of the items or services in the classifieds.